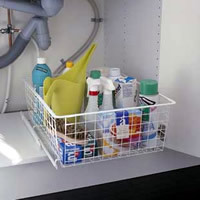 Our Robust freestanding elfa starter basket kit is ideal for clothes storage in the bottom of wardrobes or for towels in the bathroom etc. 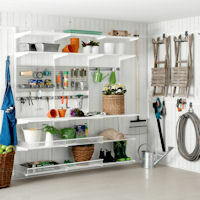 Organise your utility room with this shelving, hanging and basket solution in classic white from elfa. FREE Design Service Available if this size is wrong for your available space! Our Elfa Tots Wardrobe Solution in white has a basket tower for folded storage and plenty of hanging and shelving for clothes and toy storage. Our best selling female wardrobe from the stylish elfa décor range offers best use of space for those with limited wardrobe space and the luxury of real wood in either birch or walnut. Our elfa decor dressing room can be finished in either solid birch or walnut and offers a complete shelving solution for your dressing room or walk-in wardrobe. FREE Design Service Available if this size is wrong for your available space! 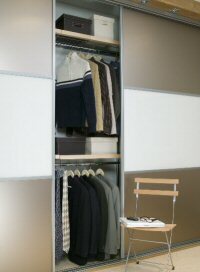 Complete elfa wardrobe storage solution with 180cm of hanging space, 4 wire gliding drawers, ventilated shelves and a gliding shoe rack. This magnificent birch and platinum solution from our stylish elfa decor range has gliding baskets, solid wooden shelves and plenty of luxury. FREE Design Service Available if this size is wrong for your available space! Functional and stylish, this wardrobe interior storage solution from our elfa décor range offers clever use of space inside the wardrobe and is finished in either a solid birch or walnut wood. 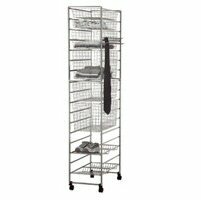 Store up to 72 pairs of heeled shoes on our elfa décor shoe storage solution within a width of just 62cm. Just great for those Imelda Marcos types with limited space. Stylish elfa interior to smarten up your existing wardrobe OR perhaps to convert a spare bedroom into a walk-in wardrobe space. Offers storage for up to 63 pairs of shoes! FREE elfa Design Service Available if this size is wrong for your available space! 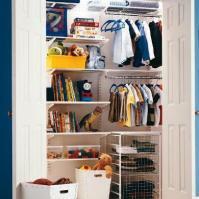 Organise your unruly teenagers with this clutter-busting wardrobe interior solution from elfa. There's plenty of space for games, sports equipment etc. and lots of hanging to ensure the school blazer will never end up on the floor again! FREE Design Service Available if this size is wrong for your available space! 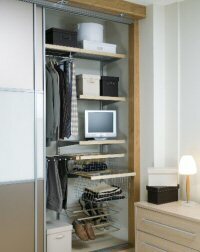 Stylish elfa storage solution to smarten up your existing wardrobe interior OR perhaps to convert a spare bedroom into a walk-in wardrobe space. FREE Design Service Available if this size is wrong for your available wardrobe interior or dressing room space! 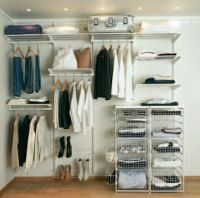 Organise and streamline your wardrobe interior or even use this elfa solution on a bedroom wall without doors to make better use of your space. 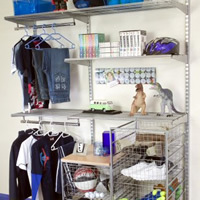 Great where a sloped roof limits space, our new elfa freestanding™ shelving solution works brilliantly when trying to organise a loft space. FREE Design Service Available if this size is wrong for your available space! Our new platinum elfa freestanding™ wardrobe interior works brilliantly when you simply can't screw anything to the wall or carcass of your existing wardrobe. 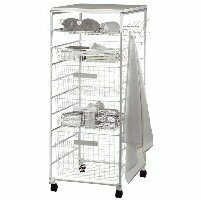 This white starter unit from our modular range of elfa storage offers ample basket space for dry food and vegetable storage. 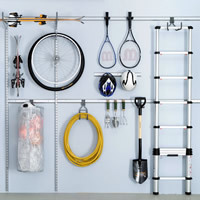 Included is a sliding bottle rack, side-hooks for tea-towels etc. and a top-board in white for additional storage above. 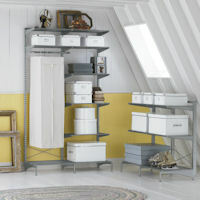 Transform your craft room or study with this amazing craft room storage furniture solution from elfa. FREE Design Service Available if this size is wrong for your available space! 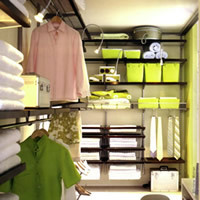 Organise your bathroom with our modular epoxy coated platinum shelving, hanging and basket solution from elfa. FREE Design Service Available if this size is wrong for your available space! This full height elfa basket tower is available on either feet or casters and offers a total in-wardrobe solution for plenty of folded clothes, linen etc. alongside, shoes, ties and belts. 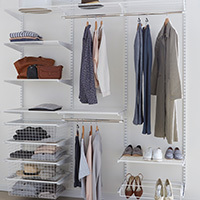 Our children's elfa wardrobe interior solution in white will grow with your child because as they get taller, each shelf or hanging space can be unclipped and moved in seconds without any fuss or drilling. Clever huh..and you only need 5 screws to erect the entire solution! Elfa decor storage solution in white and solid birch or walnut wood to smarten up your existing wardrobe interior OR perhaps to convert a spare bedroom into a walk-in wardrobe space. FREE Design Service Available if this size is wrong for your available wardrobe interior or dressing room space! 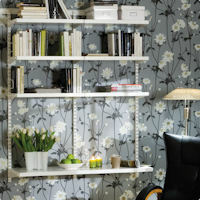 Solid wood Nordic-made fully adjustable shelving unit from our friends at elfa to store your ornaments and books. FREE Design Service Available if this size is wrong for your available space! 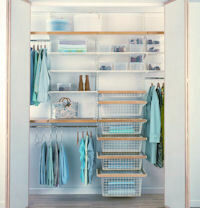 Stylish elfa classic storage solution in glossy white to smarten up your wardrobe interior. 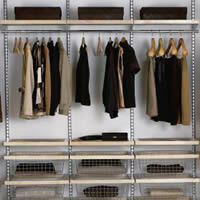 FREE elfa Design Service Available if this size is wrong for your available wardrobe interior or dressing room space! Need plenty of hanging space? 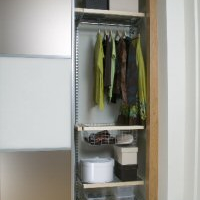 Half height above half height elfa hanging really offers best use of space for your wardrobe interior & can be very cost effective for larger spaces too. FREE Design Service Available if this size is wrong for your available space! 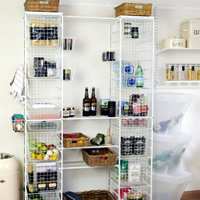 Our elfa freestanding Ultimate Pantry shelving and drawer unit is the perfect solution for food and drink storage. FREE Design Service Available if this size is wrong for your available space! 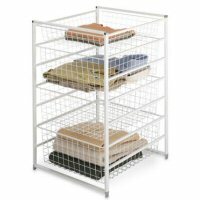 This full height elfa basket tower in white is available on either feet or casters and offers a total in-wardrobe solution for plenty of folded clothes, linen etc. alongside, shoes, ties and belts.